We thought we'd chuck a few wonderful guest photos onto the blog from our second-favourite cycle city - Amsterdam. 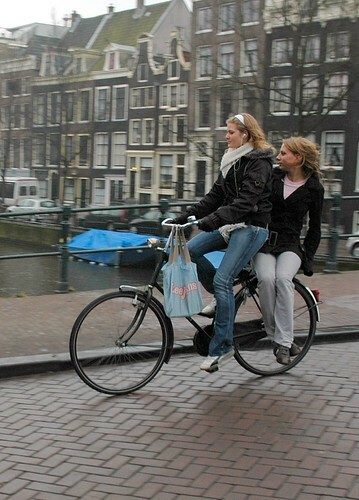 A lovely photo above from Smudo, of an Amsterdamer riding either to or from field hockey practice. And this classy lady deserves a place on Cycle Chic for keeping it cool, sassy and stylish on the Dam Square from the Flickr photographer Barbara. Here's a classic doubling shot - could be Copenhagen or Amsterdam - a wonderful mood captured by Stosh26. Great shots! I love way the girl in the top shot is covering her face, but peeking at the photographer and smiling.